Ex post facto reference : Where can I find the Dayton Journal? I love looking at the list of “search engine terms” in the stats section of this blog. It is a list of the phrases that people typed into search engines that led them to some section or other of this blog. You can view this information in various time increments, including today, yesterday, this week, etc. For instance, the “all time” most popular term to lead people here has apparently been “post mortem photography.” Geez, do I really talk about photographing dead people that much? Oops. Sorry! More likely, that is simply a topic I have written about that has been of interest to the broadest number of people. But, getting back to my title. Sometimes, I look at the “search engine terms” list and wish I had a way to contact the person because it sounds like they have an interesting research topic. Or, they have searched for a topic on which I know I could have helped them find some great primary source materials — maybe something in the archives where I work! Hopefully, that’s what led them to my blog, and hopefully, I said enough in whatever static page they viewed, that they found those resources eventually anyway. But it still makes me wonder. So today, I’m finally going to actually write one of those ex post facto reference responses. First a tidbit of history : The Dayton Weekly Journal was published in Dayton, Ohio, from 1826-1904. (There were also some earlier editions of various “Journal” newspapers in Dayton as well.) 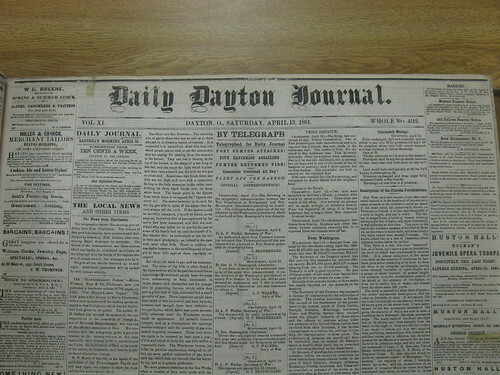 A daily edition of the Dayton Journal newspaper was published from 1847 until 1949. In 1949, the Journal merged with the Herald and was published as the Journal Herald until 1986, when the paper combined with the Dayton Daily News (which is now the only “main” newspaper in Dayton, Ohio). 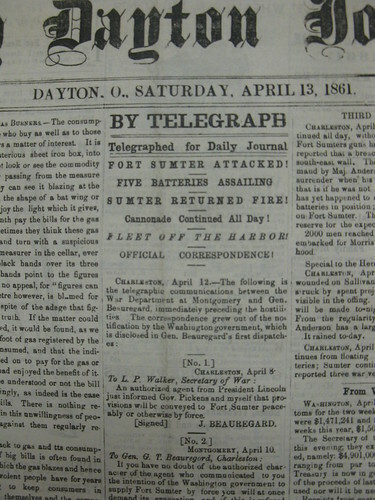 An original paper issue of the Daily Dayton Journal, 14 Apr 1861, announcing the attack on Fort Sumter, South Carolina. Now, back to the original question : Where can you find the Dayton Journal? The most complete run of the Dayton Journal available anywhere can be found a the Dayton Metro Library (where I work). 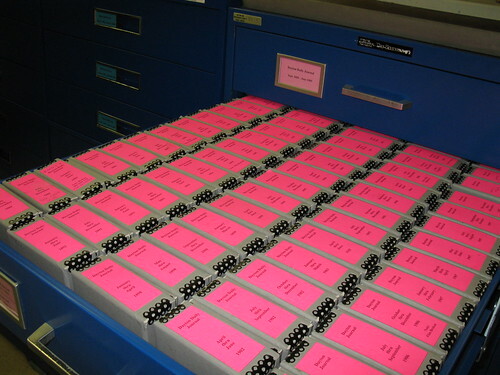 We have a complete run of microfilm from 1862-1949, as well as many scattered earlier issues on microfilm. I could probably stop right here, but since as an archivist, I have a bit of a passion for manuscripts — and for telling people about them — I have to do you one better. I’ve already told you that the Dayton Metro Library has an extensive collection of issues of the actual Dayton Journal newspaper — as well as the other newspapers I mentioned, the Empire, Democrat, and Daily News (and a whole host of others I didn’t mention). But if you’re interested in the men behind the newspapers, you might also be interested to know that we have manuscript collections for both William D. Bickham (MS-017) (editor of the Republican Journal for 30 years in the late 19th century) as well as his counterpart at the Democrat, John G. Doren (MS-011, unprocessed), of the same era. For some reason, I find it a bit hilarious that Bickham’s and Doren’s papers are stored within a few feet of one another, when the two no doubt spent years engaged in politically-charged media sparring. All in all, I suppose that was a really long way of saying, “You can find copies of the Dayton Journal at the Dayton Metro Library, OHS, and a few other places.” But if I haven’t made at least a handful of statements that start off “you might also be interested in…,” then I’ve only done my reference job halfway. I’ve been involved in Dayton, history, and Dayton’s history…for about 10 years now. So sometimes I forget that there used to be a time when I didn’t know very much at all about the Wright Brothers. Sure, I knew that they “invented the airplane” (so simplistic!). Yes, indeed, there was a once time when I was barely aware of what actual names of the individual Wright Brothers were — Wilbur and Orville — much less which one was which (Orville’s got the mustache!) or what year they made that first flight (1903!) or that they owned a bicycle shop. But even those who are at least vaguely aware that the Wright Brothers built bicycles before they built airplanes, might not know that even before that, they operated a printing business. Young Orville and his friend Ed Sines started Sines & Wright printed the lone issue of The Midget in 1886. Later, Wilbur joined forces with his brother under the name Wright & Wright Printers. 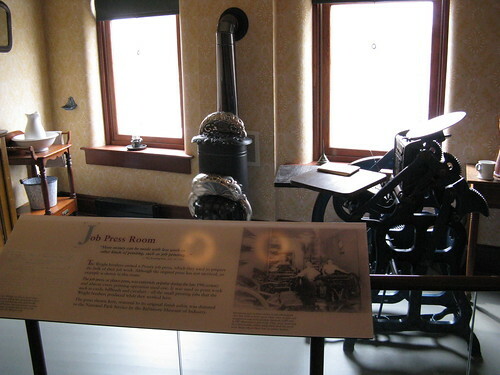 They built their own printing presses, and in addition to doing all kinds of job printing, they printed three publications of their own: the West Side News (1889-1891), the Evening Item (1890), and Snap-Shots at Current Events (1894-1896). The Dayton Metro Library has original copies of most issues of all four of these publications — the copies that were kept by the Wright Brothers themselves in their own collection and were donated to the library after Orville’s death in 1948. These originals were microfilmed for preservation several years ago, and last year, the library had that microfilm digitized to enhance access to the newspapers, which comprise an important and interesting Wright Brothers resource. The Midget : A newspaper published by Edwin Sines and Orville Wright of the firm Sines & Wright. Only one issue was ever printed. The Midget, vol. 1, no. 1 (Apr. 1886). West Side News : A weekly newspaper focused on events in West Dayton. West Side News, vol. 1, no. 1-52 (Mar. 1, 1889-Mar. 22, 1890) ; vol. 2, no. 1-2 (Mar. 29, 1890-Apr. 5,1890) ; vol. ? (May 2, 1891). Evening Item : A daily newspaper that focused on world events. The Evening Item, no. 1-78 (Apr. 30, 1890-July 30, 1890). Snap-Shots at Current Events : A weekly magazine aimed at cyclists in Dayton. Snap-Shots at Current Events, vol. 1, no. 1-13 (Oct. 20, 1894-Jan. 10, 1895); vol. 2, no. 1-6 (Feb. 29, 1896-Apr. 17, 1896). The original newspapers can be found at the Dayton Metro Library, 215 E. Third St., Dayton, OH 45402, in the Local History Room, MS-001 Wright Brothers Collection. You can also learn more about the Wright Brothers as printers at this great online exhibit from the Smithsonian National Air and Space Museum; and The Other Career of Wilbur and Orville Wright by Charlotte & August Brunsman, online at the Centennial of Flight web site. Large and significant collections of original Wright Brothers materials can also be found at Wright State University, Special Collections & Archives, and at the Library of Congress. And don’t forget the exhibition at the Smithsonian National Air & Space Museum. And finally, if you’re looking for a comprehensive but also pleasantly readable biography of the Wright Brothers, you’ve got to check out Tom Crouch’s Bishop’s Boys: A Life of Wilbur and Orville Wright (find at a library, or at Amazon). April 12th marked the 150th anniversary of the first shots of the Civil War at Fort Sumter, SC. I was curious what the newspaper headlines looked like, so I decided to check it out in bound volumes of Civil War era newspapers at the Dayton Metro Library. Looks like capital letters, spacing, italics and exclamations points were the old-school tools of print media to get an urgent message across! 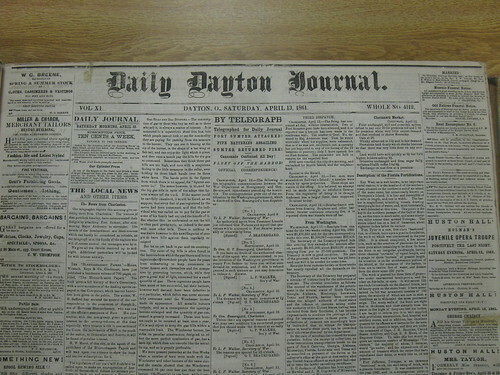 The Daily Dayton Journal was the Republican newspaper in Dayton at that time. The Democratic paper was the Dayton Daily Emipire (of which notorious Copperhead and Daytonian Clement Vallandingham was an early part owner). Unfortunately, the library does not happen to have any issues of the Empire for April 1861. I did, however, look at a few issues from 1860, which included an interesting note on “True Republicans”. If you know anything about the history of the press, you know that newspapers could be very political and papers with opposing viewpoints often sparred with one another. For instance, here’s another snippet from the Empire proclaiming to include “a great many things not in this morning’s Journal“. Oh politics and the press… I can still remember a time when I didn’t realize the media was partisan. Ah, to be young again. Ha! 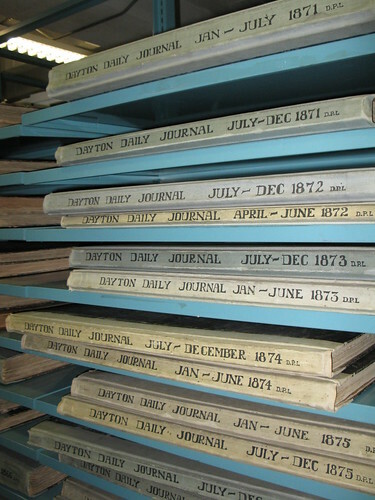 Also of interest: The Dayton Daily Empire will be included in the next round of digitization for the Ohio Newspaper Digitization Project by the Ohio Historical Society. In honor of Presidents’ Day (which is today), I’m going to share a little about a collection I’m processing (at the Dayton Metro Library) that has presidential ties. For the past several months, I have been processing and creating a finding aid for the Bickham Collection (MS-017), which primarily consists of letters and news clippings pertaining to William Denison Bickham (1827-1894), the editor of the Dayton Journal newspaper from 1863 until his death. The Journal was Republican in its politics, and after the arrest of Copperhead [anti-war Democrat] leader and Dayton congressman Clement Vallandingham, an angry mob set fire to the Journal office on May 5, 1863. (Read more about it.) The man who stepped up to the challenge of rebuilding (literally) the Journal was William Denison Bickham, a young war correspondent for the Cincinnati Commercial. The new Journal office would be at 25 N. Main (view photo) from 1864-1881. Bickham was said to have endured many threats for the things he wrote, but he never backed down. What does this newspaper editor have to do with Presidents’ Day, you might be wondering. Well, I’m sure this will come as a shock, but politicians like to war with each other through the press, by writing letters and making sure their contents got printed. But back to Bickham and the presidents. Depending on your specific criteria, Ohio lays claim to seven or eight U.S. Presidents. The problem lies with William Henry Harrison, who was actually born in Virginia; the other seven – Grant, Hayes, Garfield, B. Harrison, McKinley, Taft, and Harding were all born in Ohio. Interestingly enough – something I guess I never noticed until today – all of those seven Ohio-born presidents were from the Republican party. [W. H. Harrison is an outlier in this category as well – he was a Whig, but that’s really just an “early Republican.”] Of the seven Ohio-born presidents, four served during the period when Bickham was editor of the Journal, and the other three were already active in Republican politics. Again, what does this have to do with Bickham? Well, upon digging into the Bickham Collection last year, I had no idea what the collection was about or who W. D. Bickham was. It was just “on my list” of things to do. Sure, I’d heard about the mob burning the Journal office after the Clement Vallandingham arrest, and yeah, I knew the Journal must have started up again because it existed until, what, the 1980s? But believe it or not, your local history librarians don’t just “know” everything there is to know about local history. Even we have to look things up. A lot. Shocking, I know. So not knowing what the collection was about, imagine my surprise – and awe – when I found folders (it was semi-processed) labeled James A. Garfield, Warren G. Harding, Benjamin Harrison, and William McKinley — containing actual letters from those people! Wow – cool stuff. There are also quite a few letters from some “less famous” late-19th century politicians – mostly Republican – mostly from Ohio. There are letters from several Ohio governors; a handful from Cincinnatian Salmon P. Chase; there are many from John Sherman, a U.S. Congressman and later U.S. 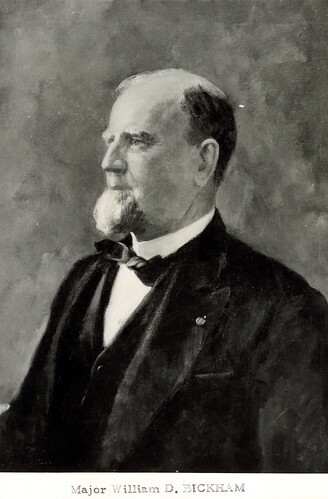 Senator from Lancaster, Ohio – and younger brother of Civil War General William T. Sherman. In most cases, these men wrote to Bickham in order to “share their views” with him – and in most cases, that meant, Please publish my views in your newspaper, kthanks. I found some examples in this collection of the original letter, as well as a copy of the news clipping where he had printed the contents. If they didn’t want Bickham to publish what they wrote, they would mark the letter as “private” at the top. It seems a little strange that they would write these “private” letters, but I suppose he probably developed real friendships with some of the men. Or perhaps they wanted Bickham to understand their position or actions (so he would keep supporting them!) but weren’t ready to share it with the world yet. The Bickham Collection is not very large – about 1 linear foot of manuscripts plus several scrapbooks (2 of which pertain to Bickham’s son Charlie’s military service in the Spanish-American War and the Philippine Insurrection). However, what it lacks in volume, it makes up for in richness and quality. This collectino is just full of gem after gem. I hold history in my hands every day, but some things just make you feel…privileged. For the record, Dayton Metro Library does not restrict access to any materials based on perceived research “value.” Our collections are available for use by all. But for sure, any serious researcher of Ohio Republican politics in the late 19th century really shouldn’t miss this collection.